If you’re looking for a top-level fishing kayak, the Ocean Kayak Trident 13 is just what you need. This awesome kayak comes with just about everything required for a fantastic fishing trip. Thanks to the improved design, it moves quickly and handles waves with ease. However, it’s not just the performance that makes it stand out. You also receive the patented ACS II seat with thick padding and a high level of adjustability, so you feel great the whole day. The cockpit is spacious and comes with adjustable foot braces, so you don’t have to worry about comfort at all. One of the huge upsides of this kayak is the large and well-organized storage space it comes with – a dry hatch, the versatile Mod Pod II compartment, and an oversized tankwell of course. But it’s not just about bringing the gear, it’s about using it too. 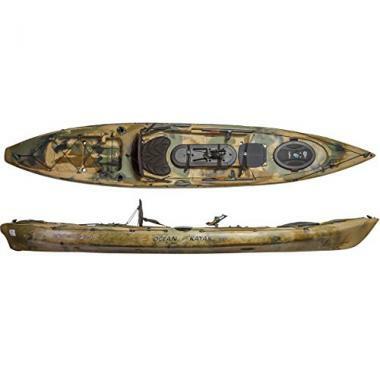 This kayak is equipped with rod holders, gear tracks, and mounts for your fishing equipment. Despite not being the most budget-friendly angler kayak out there, the overall quality makes it worth it (many satisfied kayakers can back up this claim). 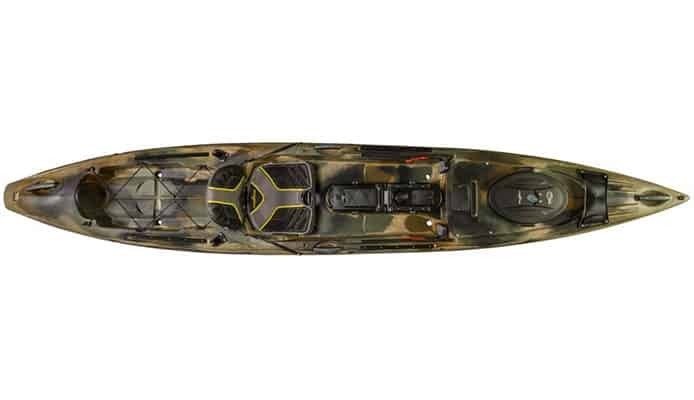 Make sure to read through the rest of this review and learn more about the specific features of this kayak, and how they can improve your fishing experience. Usability: Anglers claim that this kayak is really easy to paddle and handles very well. Thanks to the streamlined hull, it’s very fast too. This is a big plus since it allows you to go farther out and reach your favorite fishing spot faster. Even though the kayak works well in any situation, it really shines in the ocean when tackling waves and rough water. You won’t have any problems maneuvering the Trident 13. It easily cuts through the water and has great tracking. If you decide you need help turning or controlling the kayak, the stern comes with screws to easily install a rudder. Furthermore, consider equipping the kayak with an anchor too, so you can remain in place once you reach your destination. Stability: This kayak is pretty stable, so you will feel secure while sitting and fishing. This being said, some of the stability was sacrificed when designing the kayak, to make it faster and perform better. This means it’s not recommended to stand up when casting the bait or when reeling in your catch. Also, never forget to wear a life jacket no matter where you’re going. Storage: Users say that packing and organizing your gear is a breeze with the Ocean Trident 13. At the bow, you get a large 20in Click Seal hatch that is very secure and easy to use. It has a gasket around the edges so it’s completely dry, making it a great place for your keys or a phone. In addition, it comes with a bag insert which can be used for the fish finder battery, or other small items. In the back, you get an oversized tankwell with bungee cords to keep the content in place. It’s more than large enough for a fishing crate with all your gear packed inside. You can also put a kayak cooler and a tackle box in there, or use the bungees to strap down a deck bag. Some kayakers leave the tankwell empty since it’s a great position for your dog to sit in when kayaking with your dog. Comfort: The comfort level you get with this one is really high. You get an ergonomic ACS II (active comfort system) kayak seat which users really like. The backrest is adjustable by height, so you get proper lumbar support. The front part of the seat can be raised or lowered for better thigh support. It’s heavily padded, while still allowing air circulation so you don’t sweat while sitting. As we mentioned earlier, the foot braces are easily adjustable. They slide on rails, so you can easily find the most comfortable position. Thanks to the large cockpit, there is more than enough space, even for very tall kayakers. The spacious cockpit has one more additional benefit – getting in and out of the kayak is really easy. In the bow area, you will find a paddle holder that doubles as a fishing rod rest. It’s convenient to lay your rod on top of it, or slide the blade of your kayak paddle underneath when you need both hands free to do something. Fishing: Kayakers agree that this is one of the best-equipped fishing kayaks on the market. Behind your seat, you get two flush-mount rod holders which are very convenient. They can also be used for holding a fishing net if you have a different rod holder mounted on one of the seven gear tracks on this kayak. These tracks are universal and compatible with different accessories from well-known manufacturers. Perhaps the best bit of this kayak is the Mod Pod II center console. This smartly designed hatch consists of two parts that open separately, or they can be lifted together. The front part has gear tracks on the sides and a cup holder in the middle, while the part closer to you has a smaller hatch with bungee cords on top, as well as a magnetic surface to secure the hooks when changing the bait. Underneath each part, you’ll find a plastic container which is great storage space for lines, pliers or a kayak knife. Both containers can be removed, giving you full access to the insides of the kayak. Some people use this space to store additional fishing rods, which is handy. Last but not least, installing a fish finder on this kayak is a piece of cake. There is a dedicated area (behind the hatch) with screws in place, and a scupper hole next to it so you can connect the transducer without having to drill into the hull. Portability: This kayak is pretty heavy, but this is to be expected considering the size and the amount of equipment. It comes with four ergonomic carry handles, but you won’t be able to carry it yourself. For this reason, many users suggest getting a kayak cart so you can easily roll it down to the water. You should know that it won’t be able to fit in the back of your pickup truck, so think about getting a roof rack or a kayak trailer to transport it. Price: 90% – While the Ocean Kayak Trident 13 Angler isn’t exactly made for those who are on a budget, we feel that it offers more than enough to justify the cost. Since it comes well-equipped you’ll save some money on fishing gear, and the tough build guarantees it will last for a long time. Material: 85% – Polyethylene is the standard in the kayak industry, and for a good reason. It’s sturdy and very resistant to dents and scratches, so you don’t have to worry about hitting obstacles while you’re in the water. Design: 100% – We have already said many nice things about the design of this kayak. It either comes with them, or makes it easy for you to install various fishing accessories. On top of this great functionality, it looks good too. Overall: 92% – This kayak leaves a really strong impression. We like everything it has to offer since it’s fully oriented towards anglers. This being said, it has it’s some limitations when using it for kayaking activities other than fishing. The Ocean Kayak Trident 13 is well-designed and has plenty to offer. It’s a real pleasure to fish in, thanks to the great weight capacity and overall gear compatibility. In addition, it’s pretty fast and offers great performance. Bottom line, if you’re looking for a true fishing kayak to take out on the open water, don’t miss out on this one. If you’re looking for a top-level fishing kayak, the Ocean Kayak Trident 13 is just what you need.